As parents, we hope to give our children every advantage in life, so they may reach their full potential. Vision plays a critical role in this pursuit, as it has been shown to be pivotal to learning and development. 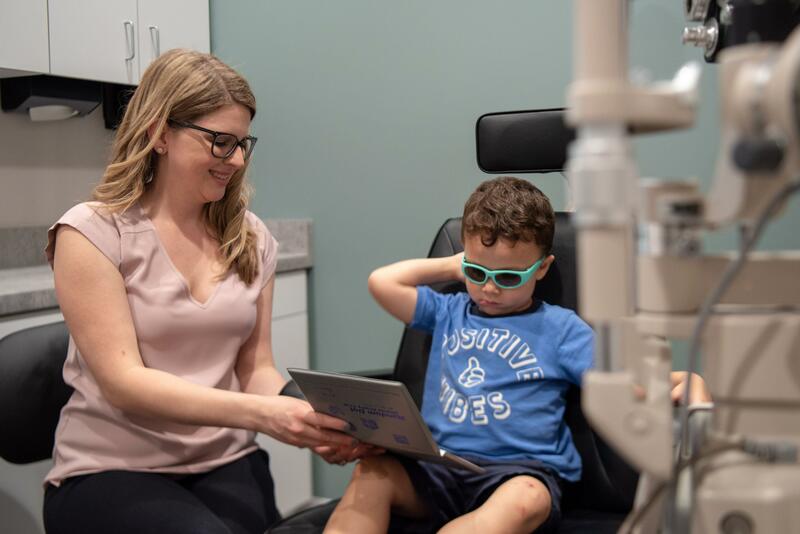 Pediatric optometrist Kara Collier, OD, at Artisan Eye in Lakewood Ranch, Florida, has the training and experience in pediatric vision and eye care your child deserves. Our pediatric eye exams are distinctly different than adult eye exams, as they are designed to meet the health, vision and functional needs of children. Request an appointment online or over the phone today. How often should my child get pediatric eye exams? As a parent, you have a lot to juggle, but don’t forget about your children’s eye health. The American Optometric Association encourages parents to bring their children for their first eye exam at 6 months of age, even if everything seems normal. Artisan Eye has partnered with InfantSEE®, a public health program, to offer free infant eye exams to check vision and eye health for babies 6-12 months old. After your child’s first pediatric eye exam, they may not need another exam until age 3, as long as you don’t notice any vision issues. It’s also important to get your child an exam before starting school around age 5. Clear and comfortable vision is a key component of getting your child ready to succeed in the classroom. What do you check when my child gets an eye exam? How well does your child see? Would your child benefit from glasses or contact lenses? Do their eyes work together as a team? Do your child’s eyes focus the way they should? Is your child’s peripheral vision normal? Can your child see the full range of colors? Can your child’s eyes comfortably track movement? Are your child’s eyes healthy? Many parents believe that eye screening tests performed with their pediatrician, at school or at sports physicals are a replacement for a comprehensive pediatric eye exam. Unfortunately, these screening tests do not assess critical components of eye and visual health such as a dilated eye health evaluation, eye pressure, eye teaming and alignment, and proper focusing ability. These tests are best performed with eye doctors specifically trained and experienced in the eye health and vision assessment of children. Starting your children with regular eye exams at a young age can ensure that any eye health or vision issues are diagnosed and treated as early as possible. Undiagnosed vision problems can lead to academic, physical, and social challenges for your child. To learn more about pediatric eye exams or to schedule one for your child, request an appointment online or over the phone with Artisan Eye today.